The website is appealing to the eye, has a lot of courses and users. There is a free (!) iOS / Android version which synchronizes with / through your Memrise web account. I get no money for recommending it, I just find it to be a very nicely polished alternative to Anki. I know that the latter is more flexible, but for the most cases Memrise is just good enough. Plus, the rankings bring in a whole new dimension by gamification of the learning / repeating process. I just can't sit there watching other people grow and getting more points than I have! They even send you an email remembering you that you have some new items to "water", as they call it. I used Memrise and found it surprisingly easy to memorize the order of half a deck of cards. I started using Anki this year to help me learn my students' names and faces, and it's been glorious. I was able to recognize about 75% of them on the first day of class, and within a few weeks I was solid on nearly everyone. That has always been one of my biggest weaknesses as a teacher, and I'm feeling great about the change. This is a great idea! I'm terrible with names and faces, and this occurred to me as a way to improve that. It's definitely heartening to see that someone has done it with good results. I found premade decks, except for the simplest ones, are of limited value as opposed to me making the deck and continously edit them. It's like taking notes, which enhance learning, as opposed to merely listening to the teacher. Also, just because it is dupe doesn't mean it is valueless. Far too few people are aware of spaced repetition as a principle to even begin using it. For example, Khan Academy have some form of spaced repetition, but it is incomplete. If people knows more about the idea, they would be more likely to implement a full system. >Also, just because it is dupe doesn't mean it is valueless. Of course, but at some point dupes get to be annoying. I'm not saying it is breaking the rules (is there even a rule for that here? ), just pointing it out. The last time gwern posted this it got a lot of attention. I've used Anki for years to learn Japanese. It made learning to read relatively painless. You do need discipline to get far with it though. I managed to get my vocab deck up over 10,000 words, but leaving it for even a week is difficult. As far as language learning goes, you also need to realise that no amount of SRS'd words is going to make you a natural, fluent speaker, so don't fall into the trap of spending all your study time reviewing. Anki is wonderful; I've been using it for a while. One nice feature of Anki is that it can sync between the web, desktop and mobile versions of the app. I stopped using it because I couldn't summon the time/willpower to work at it every day. When you leave a deck for more than a day, the work starts to accumulate like crazy and it takes much more effort to catch up. I've set up a cron job to automatically open the app at 7 in the morning every day (and to minimise all other apps would be nice but I can't find anything to do it). I'll also set up the same functionality on my iPhone (jailbroken devices can do this with Activator). Possibly, but I run OSX. Your reply did make me take another crack at it and I got it to work. The script if anyone is interested: http://pastebin.com/pC9VTzjv. It does do some specific-to-me things to close apps I usually have open that did not want to minimise. It's important to remember that you don't have to review all your "due" cards at once. Just open it up and do one card per deck. Maybe you'll do more as you get going or if the next card after the first is easy. It accumulates, but over time as you actually memorize things you'll whittle the due set down as every card starts becoming "due" months into the future. Don't study too many cards then. Nobody is saying that you have to finish all the dues. I'm the other developer of AnkiMobile along with Damien Elmes, creator of Anki. The iOS app is the sole source of income for Damien, who develops, hosts and supports the entire Anki ecosystem for free. At some point a few years ago, Anki was taking up so much of his time that he had to decide whether to quit his job or stop developing it. He chose to quit his job and make a paid iOS app. I think £17.50 is a reasonable price for such a complex app. Many people who own it use it for over an hour a day. If you think of it as less than ten cups of coffee, and consider that you would pay much more for a textbook, I think it's a good value investment for the educational return you get. If you really really cannot afford £17.50, you could always join the beta program next time there's a call for testers on the user group, or you can use the web version on your phone. I'm someone who has been using Anki for over a year now and I'd like to say that the value that I've gotten from Anki is equivalent to the value I'd normally need to pay $1000+ for with traditional modes of learning (books, courses, etc.). Even at $200 Anki would be a steal. The problem with expensive apps (just very generally speaking) is that Apple's App Store doesn't currently have a way to trial them. Even if an app is worth $200, there's no way to find that out beforehand. This is made worse by an awkward refund process and presumably a cost to the developer too with refunds. With regards to how you arrive at the $200 figure: for you, Anki is competing against "$1000+ for with traditional modes of learning", and so you feel it's worth up to $200. Well, it's also possible to frame it the opposite way, because for me Anki is competing against traditional (free) libraries and a $1 stack of flashcards, in which case it seems way overpriced to me. So I don't think that's a compelling argument either way. I agree with this criticism of the app store, and I don't really see a solution unless Apple introduces this feature. Thanks for taking the time to reply. Ultimately, you can (of course) set whatever price you like, as is your right. I don't expect to change your mind on this. I don't necessarily think the complexity argument is a good one though. I have plenty of apps that are arguably more 'complex' but priced more cheaply, and presumably sell more as a result of being cheaper. Could yourself and Damien not make an equal amount of money from the iOS port by having a cheaper app and making up for it in volume? I appreciate support costs do not scale trivially in a case like that, but is that something you've thought about or explored? If the price is a gesture against the app store's 'race to the bottom', then that's admirable, but this just seems like too far – especially considering the audience for your app (in my opinion). Regardless, whether it's intended that way or not (and I suspect not), it feels like I'm being punished for using an Apple product because the price of your iOS app is so different from every other platform, and that isn't a nice feeling. Damien did experiment with having a much lower priced app. What happened was that a lot more people bought it just by browsing the app store for a flashcard app, then got confused by how complex it is, then left negative reviews. The ratings plummeted. The current price is a result of extensive experimentation with price and user base. We discussed the complexity issue with existing Anki users and they don't fid it complex - but people who aren't already using Anki do. By setting the price higher, volume of sales is sacrificed in preference of selling to people who understand what they are buying. If people want to buy the cheaper app, that's OK. Some of them are great apps (nowhere near Anki imho, but I'm biased :). We hope that people who derive real value from using Anki every day will understand that the price is a way for them to support the whole Anki ecosystem. I agree that the price is a 'hump' that many people won't get over. But if the tool is useful, claiming it's too pricey for students can't be right. That price is less than your typical textbook. Sure, you're comparing the price to free on desktop, but I suspect you're also somewhat comparing it to typical app store prices. We've been educated that software for our mobile devices costs a nominal fee. It's only of use to students who can afford an iOS device. Probably a demographic with an higher income than the average student. It's this idea that really bothers me, I think. I don't know if the developer subscribes to this idea or not, but whenever I see an iOS app priced way differently to it's counterparts on other platforms I suspect it's either motivated by this idea or otherwise some principled stance against Apple. In either case, it isn't nice as an individual to be singled out as a target for extra cash because of the platform you run on. Just because I use an iPhone doesn't mean I have more money than my peers (and in fact probably means I have less!). Even if that were true on aggregate, I still find it unpleasant, simply because there will be many exceptions. Just because I use an iPhone doesn't mean I have more money than my peers (and in fact probably means I have less!). Assuming the iPhone is yours, sure it does; at least, more money than a student who can't afford £17 for a learning tool. The iPhone itself is an asset that is worth money. SRS is one of those things that make thinking about education depressing because it makes it obvious that merely being a massive improvement over the status quo isn't enough to get widespread adoption. It is absolutely wonderful. I recommend downloading a shared deck and using it to get into the habit, then building your own. There are better and worse ways of using it but it's been a real help to me in learning Chinese. Spaced repetition is great, but be warned - it's no substitute for really learning the content. It won't let you draw connections between concepts, because the information is presented in bite sized chunks in a way that each concept is considered independently, not parts of a whole. I've found that I learn things much better when I see how they are interconnected and AFAIK this is supported by research. For this reason, if you're considering using spaced rep for university courses I recommend that you write your own flashcards, not use somebody else's. The process of converting the knowledge in the course into appropriate flashcard sized pieces is a pretty handy way of learning the information itself. If anyone is interested in using spaced repetition for language learning, you might like to give http://readlang.com a shot (disclaimer - my site). It generates a flashcard every time you come across an unknown word or phrase while reading a book or website, and each flashcard includes the context sentence. You can also export to other software like Anki. I checked out the site. Congrats for great work. I'll recommend it to people I know. There are so many language pairs you support. What sources (dictionaries) do you use for translations? Wiktionary? Since each word might translate differently in different contexts, do you also select the most appropriate translation to display? It would be interesting to discuss about the most optimal methods for that. Google Translate often gets this wrong. (I am working on NLP/AI for language learning myself although we will mostly use it for conversations at first.) I believe many people here can give interesting perspectives on this hard problem (semantic disambiguation for translation). For the inline translations I use the Google Translate API, which is surprisingly good for words and short phrases. Unfortunately the API doesn't provide multiple translations, even though they show them on their own web site. Grrr. Users are encouraged to edit translations before learning them, and I often think it would be awesome to crowd source appropriate translations for given contexts using this data. I'm getting ahead of myself though, I'd need orders of magnitude more active users and development time for that to work. Just an idea. For some individual words and common phrases, you can supplement the API translation with info from Wiktionary and many freely available dictionaries on the Web. When you have a lot of users, providing static translation for individual words with single meaning should also save you money in the long run, as Google Translate API charges you for all translations the user activates. I did look into Wikitionary briefly but it looked horrible to use since the data isn't stored in a structured format. It seemed I'd need to parse the wiki markup and the formatting conventions were different for the different languages, which would make it a tricky job to support all the languages that Readlang does. It made me wish for an alternative open bilingual dictionary project which is structured and machine readable. I just wanted to point out that Emacs supports spaced repetition (through org-mode's plug-in org-drill) for those fond of keeping things in plain text. Is there any SR tool that can just remind you to review stuff while taking into consideration the date it was added? The use case is as follows: Suppose I read some article on some neat python tricks today, if I don't review it or use it I am going to forget it in a month. But if I note that I learnt it today, the program should remind me after say 3 days later, two weeks later and then probably after one year. My understanding is that Anki cannot do this, since it doesn't know when things are added. That's exactly what it does. Every spaced repetition tool takes into consideration how long it has been since you last got the flash card right. When you add a card, the time you added it at is used as the last time you got it right. Anki does know when notes are added, and I'm confused how what you're asking is any different than how Anki normally works. Ok I didn't know Anki knows when notes are added, thats great. Also I don't need front and back sides. I just want a note on the front that states what I need to refresh about.. but I guess I can just leave the back side of the flash card empty for that, I suppose? Only marginally related, but what the heck is going on with the text on gwern's site? Are the per-character varying gray values supposed to convey some kind of information? What a coincidence that sites using it, including the beelinereader.com site itself, use super-tight line-height. Thing is, line-height helps with the same issue (but without the weird colors), so if they'd fix that, the funky colors aren't as useful anymore. But I guess we gotta save the trees from those printing their web pages or something. Whatever one may prefer, I see they offer a plugin, which is a better way to use this tech, not by random sites forcing it on us. > What a coincidence that sites using it, including the beelinereader.com site itself, use super-tight line-height. Thing is, line-height helps with the same issue (but without the weird colors), so if they'd fix that, the funky colors aren't as useful anymore. > Whatever one may prefer, I see they offer a plugin, which is a better way to use this tech, not by random sites forcing it on us. Is it intentional that the text starts out as all black and slowly changes color line by line down the entire document over the course of about 10 minutes, or is my android browser hitting some sort of pathological performance scenario? Looks like an aesthetic novelty rather than something functional. Even as an aesthetic novelty, it's a fairly pleasant one, or at least unobjectionable since it's fairly muted. Gwern's articles can be quite hard to read, being a wall of text, and their structure tends to be much more spread-out than your typical introduction, body, conclusion - articles tend to have several 'chapters'. I wrote http://www.memorific.com to be a spaced repetition tool/community for software related topics. Collaboration is easy, which was something I really wanted to see in this space...building knowledge together (like in a class or small team context). Personally it's helped me retain some Go language concepts as I learn. I've been building a small-scope SRS app for my high school's mandarin curriculum as a side project in Node. Building a simple Leitner system is amazingly simple, and while I don't support the same level of analytics as Anki, the effect is similar. I'm looking foward to launching later this week! My problem with SRS is that it is useless for the first stage of memorization. The "vocab sheet" (20 word+definition lines, on a sheet) style is much more effective for me, and if this was available for any of the SRS vendors I would start using it immediately. You know, you can just copy the title of the linked article (which was spelled correctly). It's less work than typing, and the chance of misspelling words is dramatically reduced. Is there an option to use SRS in command line or VIM? Ok, why on earth is almost every word in this article body a different shade of gray? I don't like articles where I need to bring up the browser dev tools just so I can read it. Oh, I hate that thing. Resizing the window takes just over two seconds to redraw, rather than being instantaneous. And when that affects the width of the text, it doesn't recolour them, so you get a bad mess. And using it on an article this long causes Firefox to have on its account explicit allocations of 214 MB, rather than the 20MB that I would consider to be slightly excessive but permissible. It appears to be an attempt to make it easier to find the beginning of the next line after you finish reading a line. However, the effect is much too subtle to be of use, and even if made more prominent, it would still ruin the typographic color and generally confuse readers. Using a more optimal column width. 50-60 characters per line is a commonly suggested range for most media. Using a more optimal leading (line-height). "Set solid" type (ex. 12px/12px) is almost always a bad idea, particularly so in a long block of text. Depending on the type, media, etc, ratios in the range of 1.2-1.8 are a good starting point for improving readability. > Using a more optimal column width. > Using a more optimal leading (line-height). Whenever something looks odd on Gwern's site, you can check his A/B testing article to see if it's intentional. In this case, it's BeeLine Reader, his newest experiment. The coloring or shading is supposed to help the eye follow the line as it saccades back and forth. The text is using BeeLine Reader. It tries to make reading faster by using that color gradient to guide the reader's eyes from the end of one line to the beginning of the next. I reads a little better with the blue and red coloring, compared to just the blue. It reads a lot better in a column width which can't be measured in positive integer miles. Unmaximize the window and you no longer need the color-cuing extension at all. Do you have any form of colorblindness? For me it fades in and out along the gray-blue-purple spectrum. In my browser it renders as perfect grays, confirmed by the inspector. Gwern is A/B testing various versions. 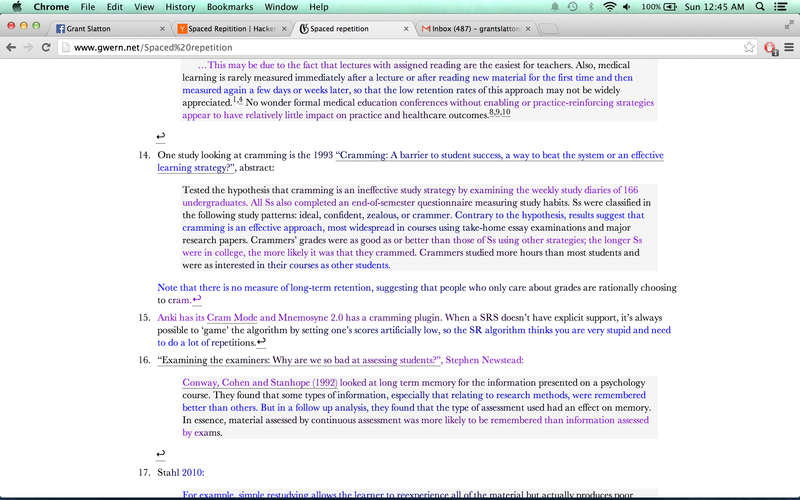 I had a red/blue variant that was one of the most aggressively ugly assaults on readability I've encountered. Basically the human mind can only hold limited amounts of information at a time in short-term memory. If we contemplate what's on our short-term memory, the probability of it being stored in our long-term memory is much higher. It's like reading blogs one after another. Later on we have difficulty recalling what was on the previous blogs that we have read (of course there are exceptions, for the geniuses out there).